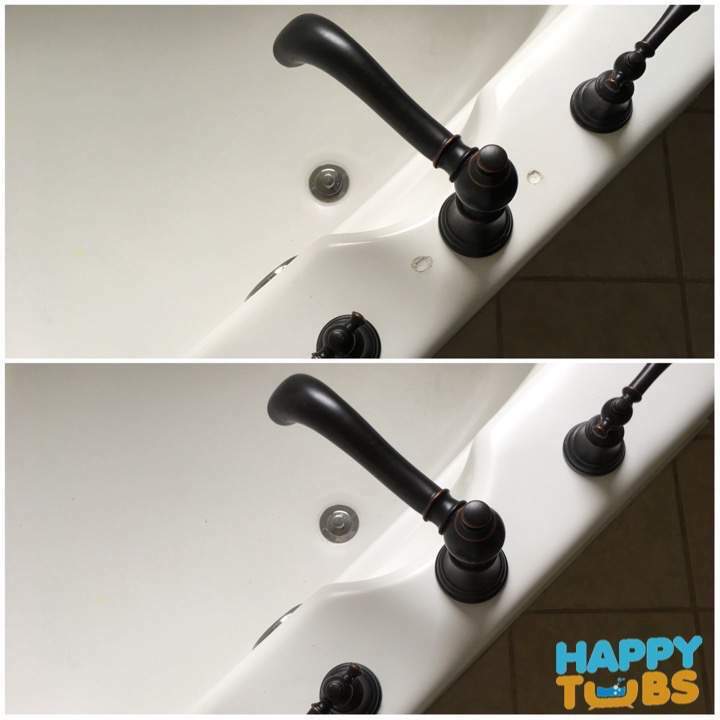 Bathtub Hole Repair by Happy Tubs. We specialize in bathtub hole repairs. 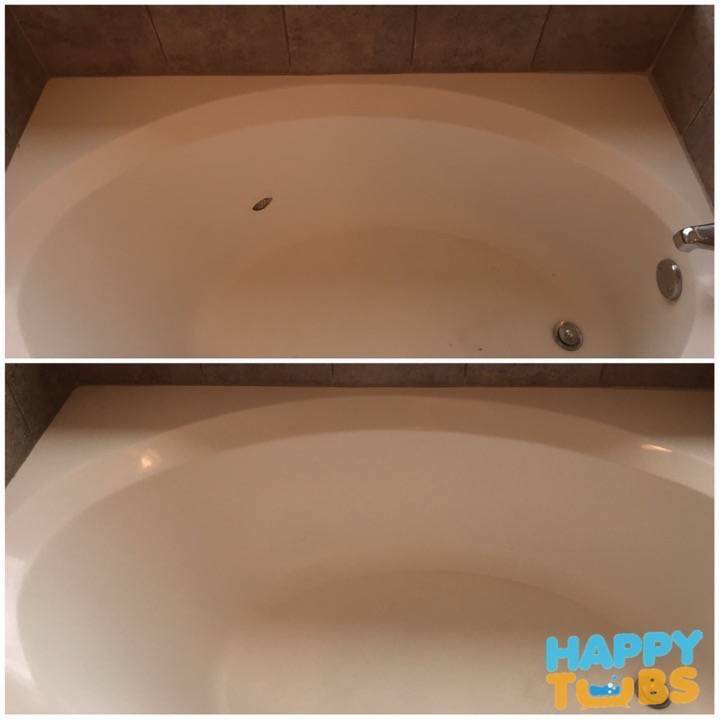 Most bathtub hole repairs are completed in under 3 hours and for only $299! We are proud to use only the highest quality Made in America materials. It's how we ensure the quality and durability of your bathtub hole repair. With our Bathtub Hole Repair Service you will get a "best in the business" Fully Transferable Warranty! We are proud to be one of the only Bathtub Hole Repair companies in the US to be contracted by the following manufacturers for their warranty repairs on new bathtubs. It gives us inside access to the best methods and materials for your bathtub hole repair needs. How much do hole repairs cost? How long before I can use my tub again? Most hole repairs are completely invisible to the eye. Instead we use a very high end filler for your bathtub hole repair. 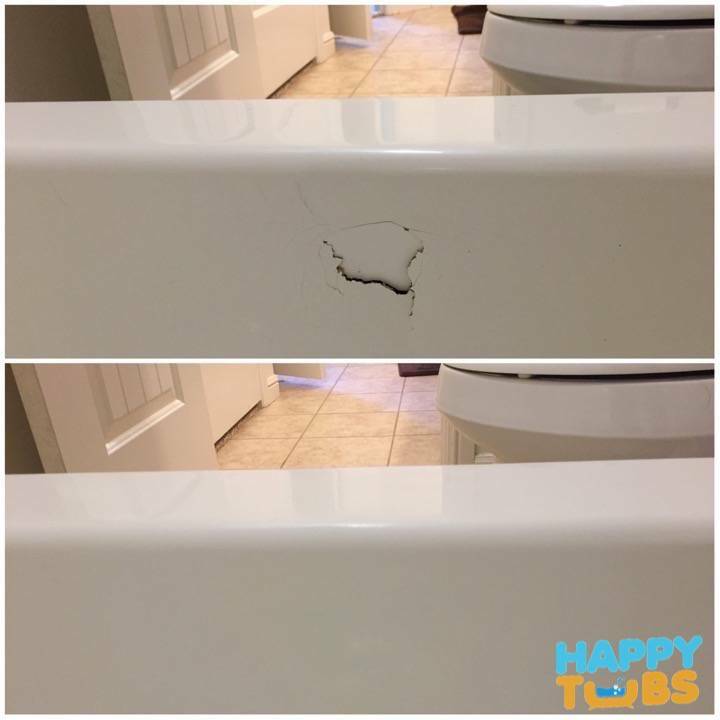 The hole repair itself is permanent, while the paint (to blend it in to the rest of the tub) will last an average of 10-15 years. What kind of holes can you repair? We first asses the damage and come up with a plan to make sure that the bathtub repair will be permanent and last as long as possible. Bathtub hole repairs for example require cleaning up the damaged area in order to ensure a complete repair. We then clean the surface with a solvent and apply a High Strength Hole Repair Filler (no automotive grade Bondo with us). The filler is allowed to fully cure and then sanded down to match the contours of the bathtub. In some cases the repair has to be much stronger than the surrounding bathtub (it did get damaged in the first place), in those cases we overbuild the repair in order to provide strength. Sometimes it pays to sacrifice looks for durability. We then match our 4K Acrylic Poly-Urethane coating to the rest of the bathtub in order to have a flawless hole repair.